Online gamers have deciphered the structure of an enzyme, which has long eluded scientists, providing insights for the development of antiretroviral drugs. The exploits are published this week in the journal Nature Structural & Molecular Biology, where - exceptionally in scientific publishing - both gamers and researchers are honoured as co-authors. 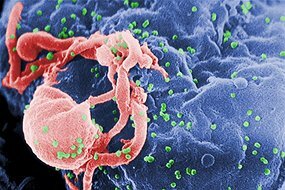 Their target was a monomeric protease enzyme, a cutting agent in the complex molecular tailoring of retroviruses, a family that includes HIV. Figuring out the structure of proteins is vital for understanding the causes of many diseases and developing drugs to block them. But a microscope gives only a flat image of what to the outsider looks like a plate of one-dimensional scrunched-up spaghetti. Pharmacologists, though, need a 3D picture that "unfolds" the molecule and rotates it in order to reveal potential targets for drugs.